When it comes to streaming devices, the Apple TV has established itself as a power player in the home entertainment category, with its ability to stream movies, TV shows, music, and more effortlessly from a centralized location for big-screen enjoyment. Even better, it offers this content in a way that Apple and iOS users are accustomed to, delivering a consistent experience across their devices. Now in its 4th generation, Apple continues to improve upon the device’s popular design and features in an effort to maintain its prominence in a crowded and still growing multimedia market. As detailed in the explora article, How to Build an Awesome Apple TV Experience, we were quite fond of the 3rd-generation Apple TV because it proved itself to be a vital component in Apple’s vast ecosystem. With that in mind, we obviously jumped at the chance to get our hands on Apple’s latest iteration of the Apple TV. At first glance, the 4th-generation Apple TV looks similar to the company’s previous versions but, if you look a little closer, you’ll notice that the latest design packs a little more beef—it has almost doubled in weight and is slightly taller than the 3rd-generation streaming player. This helps to give the new Apple TV a more premium and high-end feel, which is immediately noticeable when unboxing the device. As someone who fondly remembers a time when a component’s weight was a bragging right, I welcome the extra girth, even if it’s just a few ounces. Inside the manufacturer’s box you’ll also find a detachable power cord, a wireless voice-enabled remote control that I’ve grown to love, and a Lightning-to-USB cable for charging said remote. If you’re a fan of Apple’s clean and minimalist packing style, it remains consistent here. Outside of form factor, Apple has made a few internal upgrades, as well. For starters, the processor has been updated from a single-core A5 to a dual-core A8 chip. If you’re wondering whether the extra processing power makes a difference, it did in my experience, leading to a fluid experience all around. The Apple TV is also now available in two versions, offering 32GB and 64GB storage capacities. The HDMI output is now version 1.4, but the video resolution still maxes out at 1080p. On the audio side of things, with the newest Apple TV you can now enjoy up to 7.1-channel immersive Dolby Digital Plus surround sound compared to standard 5.1 Dolby Digital found in previous models. Apple removed the digital optical audio output in the 4th-generation player; we imagine this is a non-issue since one of HDMI’s biggest draws is its ability to transmit audio and video simultaneously over a single cable and has reached a point where it’s present on the majority of today’s A/V components. For users who prefer a wired Internet connection, the rear of the unit still houses a 10/100BASE-T Ethernet port. In regard to wireless connectivity, Apple still has you covered with built-in Bluetooth 4.0 and AirPlay streaming. AirPlay is one of Apple’s most lauded features, and for good reason, since it allows compatible devices to share content wirelessly and easily, including music and photos, as well as screen mirroring with connected iPhones, iPods, iPads, and computers. Wi-Fi has been upgraded to support 802.11a/b/g/n/ac routers, and dual-band support allows for 5 GHz connectivity. Once connected, a quick visit to the device’s settings menu will allow you to see the “What’s New” section, which highlights other new notable features such as Siri and Dictation, Apple Wireless Keyboard support, Live Tune-In, Folders, iCloud photo support, and Search Apps. Using the included remote control, these features offer optimized user interface navigation and system control, something Apple continues to improve upon in each new model. We’re happy they’ve made the effort and it hasn’t gone unnoticed. Siri isn’t a new technology for Apple, considering it’s been a standard application on every iPhone since the 4s; iOS users are quite familiar with its voice-recognition prowess and signature female voice. You can use Siri by speaking into your compatible smart device’s microphone and asking things like the time of day, weather forecast, and sports scores, and expect to receive quick and accurate answers. She even has a sense of humor, which is necessary for those of us who expect Siri tell us things like the meaning of life. Voice control isn’t new either—we’ve seen it implemented on other streaming players and even some devices that offer smartphone connectivity. Using our voices to explore is growing in popularity and offers a great deal of convenience when implemented correctly. If it isn’t, it runs the risk of being relegated as just a novelty. I wasn’t surprised to see tried-and-true Siri support in the newest Apple TV. What did surprise me was how much I enjoyed using it. Thanks to its dual-microphone array, most commands are recognized the first time you say them, because who likes repeating themselves? Voice interaction isn’t the remote’s only trick—at the top of the remote you’ll find a Glass Touch surface similar to the touch pads found on notebook computers. Simply slide your finger across and click its surface to navigate and explore. To replace the directional buttons found on most remote controls, the touch interface must be accurate and intuitive and, thankfully, it is. In the Remotes and Devices settings menu you can even change touch tracking to slow, medium, or fast, allowing you to select the option that best suits you. Remember the Lightning-to-USB cable I mentioned earlier? It’s used to charge the remote; battery level is also viewable in the Apple TV’s menu and is estimated to last months before recharging is needed. 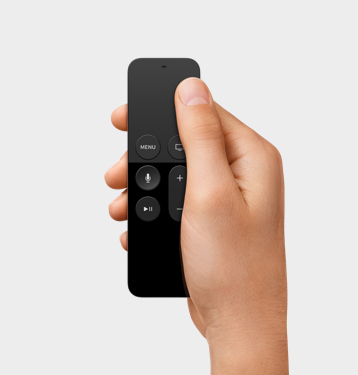 If you choose to not use the Siri-enabled remote, the Apple TV supports control from a smartphone or tablet via a remote app and Apple Wireless Keyboard connectivity. 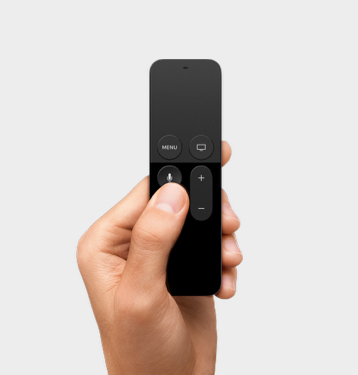 If you prefer to use a universal remote control, the Apple TV’s IR interface will allow you to use it, but you may have a hard time parting with the simplicity and function of the Apple TV’s included remote. And because the remote doesn’t rely on IR communication, it doesn’t require a clear line of sight for use. This is one of the exceptions where I recommend using more than one remote control; it’s simply hard to put down. In fact, dropping it has become a bit of a concern; I’ve even considering bubble-wrapping it for safety. Needless to say, I’m keeping this one away from the kids. Thanks to the remote, performing basic and advanced functions on the Apple TV is a breeze. One of the first commands I performed on its user interface was using the new search capabilities. By simply holding down the remote’s Siri button and saying “Game of Thrones” I was taken directly to a page with information about the series page and was shown which apps I could use to watch the show. If the app isn’t already installed to the Apple TV’s internal storage, you can choose to go directly to the App Store and download it, which of course, I did. Within a specific app you can use the dictation feature and use your voice to spell out letters or speak whole phrases; I found this especially usefully when searching YouTube content, where typing can sometimes feel tedious. Getting back to the Touch Glass surface, sliding your finger left or right allows you to fast-forward and rewind content easily. The App Store offers several content categories including Games, Education, Entertainment, Health & Fitness, Kids, Lifestyle, New, and Sports. There’s pretty much something for everyone. While it’s been known for quite a while that Amazon’s Video App isn’t currently supported, you’ll find most of the major players available for download, such as HBO GO, Netlfix, Hulu, Showtime Anytime, and more. Live TV options also exist, thanks to the apps like Watch ESPN, HBO Now, and CBS. Please remember that some services are paid and/or require subscriptions. Furthermore, Siri voice interaction allows you to switch easily between content with looking for back and menu buttons. Siri couldn’t help me with Crossy Road however; the remote’s Glass Touch surface was my only road-crossing ally. Thankfully, the remote is also equipped with a gyroscope and accelerometer. Third-party gaming controllers are also available and sold separately. You can stream all sorts of entertainment media through the 4th-Generation Apple TV. 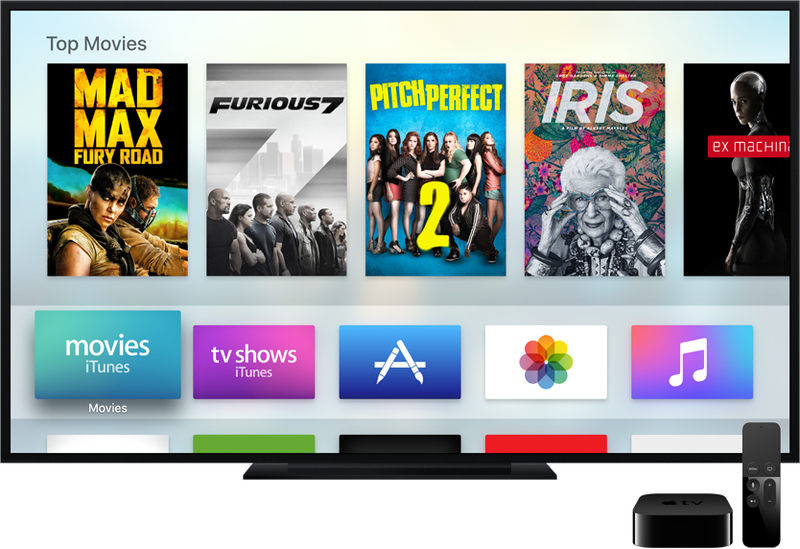 If you already have iTunes movies, TV shows, and music, you can access your content easily, directly from the Apple TV via the dedicated apps. Using the Photos app, I was able to view my shared and iCloud store photos. If you have an extensive iTunes music library it’s all there, too, and Siri can be used to shuffle your entire library. Apple Music subscription support is also on board, expanding your musical options even further. Once you start downloading additional apps, your home screen can start to look a little hectic; you can also choose to rearrange apps or even place them in folders for easy access. There’s no shortage of streaming options these days, but if you’re already invested in Apple’s Internet-connected services and iOS devices, a clear choice emerges. In its 4th-generation, the Apple TV continues to deliver when it comes to all-encompassing home entertainment and multimedia content delivery, but now it delivers those services more easily than ever and, thanks to the App Store, new options are always within reach. With its mix of live and on-demand content, the Apple TV kept me thoroughly entertained, while its remote control added an unexpected level of convenience that took the experience to another level. If you need help deciding how the newest Apple TV fits in your home entertainment environment, contact us—we’re here to help. Will Apple tv be able to stream in 4k? The current Apple TV would not be able to stream in 4k. Unfortunately, there's no information on when or if Apple TV will be able to support 4k at this time.